MUMBAI: Prompted by inflation fears and emboldened by growth, Urjit Patel on Wednesday delivered his first rate hike since taking over as Reserve Bank of India (RBI) governor in September 2016. It’s also a first during Narendra Modi‘s four-year tenure as PM. While economic growth makes every government happy, it dreads sharp price rises, especially ahead of elections. The Modi government will be praying for a good monsoon because it’ll help spur growth and check inflation. In a show of unanimity, the six members of the central bank’s monetary policy committee (MPC) voted in favour of a 25-basis-point (100bps = 1 percentage point) hike in the policy rate, taking it to 6.25 per cent. It could lead to another round of marginal increases in home loan rates in the coming months; all major banks have in the last one week raised lending rates by 10bps. Wednesday’s hike follows five rate cuts during Raghuram Rajan’s time as governor – four of 25 bps each and one of 50 bps – and two, both for 25bps, by Patel, the last being in August 2017. Patel has maintained the RBI’s stance at neutral, which means that the central bank could go either way in the next policy in August. Patel said RBI’s decision was driven by its inflation-targeting mandate. 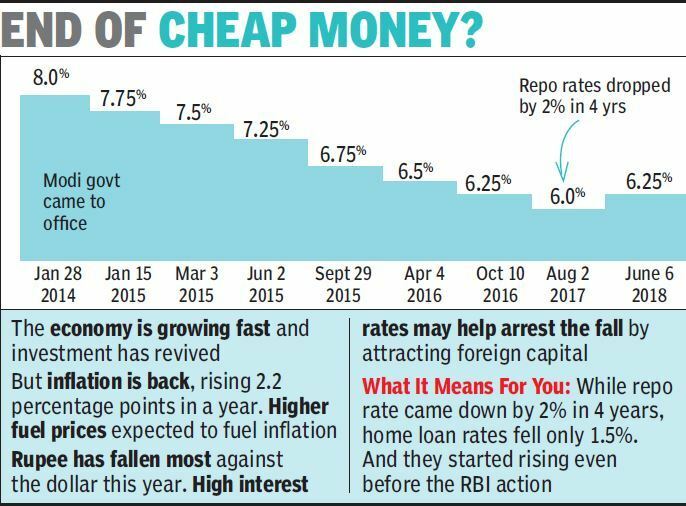 The last rate hike – for 50 bps, to 8 per cent – was by Rajan in January 2014. In its statement, the RBI said that domestic economic activity has exhibited sustained revival in recent quarters and the output gap has almost closed. “Investment activity, in particular, is recovering well and could receive a further boost from swift resolution of distressed sectors of the economy under the Insolvency and Bankruptcy Code,” it added. What has tempered the positive sentiment created by sharper growth – the Central Statistical Organisation last week announced a healthy 7.7 per cent economic expansion for January-March – is the spectre of inflation. Data released since RBI’s April policy showed inflation jumped to 4.58 per cent in that month from 4.28 per cent in March. It is showing signs of firming up further with crude oil prices rising more than 10 per cent. The rupee has also come under pressure with the US dollar gaining against most emerging market currencies. According to Bank of India MD & CEO Dinabandhu Mohapatra, the fact that the RBI has revised its consumer price inflation forecast upward to 4.8-4.9 per cent for the first half of FY19 shows that it will keep a hawk eye on retail prices in the months ahead. While a rate hike will lower the value of banks’ bond portfolios, the RBI has provided lenders some relief by allowing them to spread losses over four quarters. Also, medium and small enterprises have been given some relief in loan repayment. And the RBI’s decision recognizing banks’ government bond holdings for meeting liquidity coverage norms will leave banks with more funds for lending, which is expected to keep rates under check. CARE’s chief economist Madan Sabnavis said, “The upside risk to the inflation emanates from the rising crude oil prices globally along with minimum support price impact.” He said the pace of inflation would depend on the progress and spread of monsoon. “We expect one more interest rate hike by at least 25bps during the calendar year 2018, whereas we cannot rule out the possibility of two rate hikes by the end of the financial year 2018-19,” said Sabnavis.